Despite fewer general internists performing central venous catheter (CVC) insertion, lumbar puncture, paracentesis, and thoracentesis, the demand for these procedures has not dropped. Because hospitalists are charged with the responsibility of coordinating inpatient care, they may be best equipped to ensure timely access to these procedures, particularly because roughly half of bedside procedures performed on general medicine inpatients are needed off‐hours. Yet little is known about the costs of a hospitalist‐run bedside procedure team or the volumes of procedures needed to support one. The objective of this study was to evaluate the cost of a hospitalist‐run bedside procedure team compared with the cost without the bedside procedure team. Costs were compared for different combinations of procedures, different productivity thresholds, and various staffing models. We conducted a breakeven analysis to compare the revenue generated from a bedside procedure service with (1) the costs of hiring an additional hospitalist to cover the incremental work associated with the bedside procedure service and (2) the revenue generated by a hospitalist who does not perform procedures. We specifically examined 4 bedside procedures: CVC insertion, paracentesis, thoracentesis, and lumbar puncture (LP). Productivity benchmarks from the Society of Hospital Medicine were used to assess hospitalist productivity. The highest revenue‐producing bedside procedure service would perform only CVC insertions, whereas the lowest revenue‐producing procedure service would perform only LPs, with other combinations of the 4 procedures falling between these 2 extremes (Fig. 1). A local hospitalist group would need to perform 7 CVCs or 16 LPs per day to break even, whereas an academic hospitalist group would need to perform 4 CVCs or 9 LPs per day. Including a medical assistant in the procedure team would increase the break‐even number of procedures by 11%–19%, whereas including a registered nurse in the procedure team would increase the break‐even number of procedures by 24%–38%. FIGURE 1. 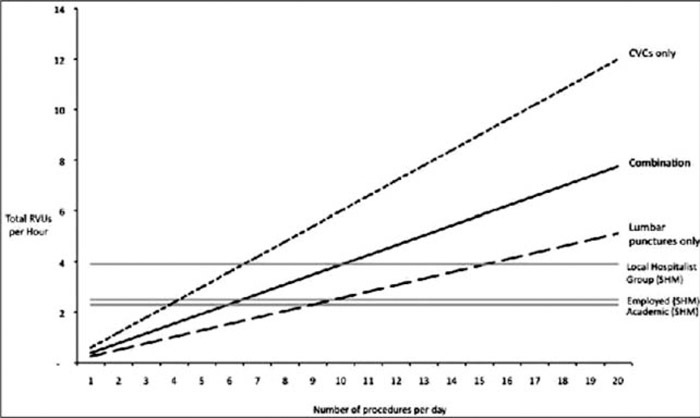 Break‐even analysis for proceduralist versus hospitalist productivity benchmarks, total relative value units (RVUs), and number of procedures per day. Benchmarks are from the 2007–2008 Society of Hospital Medicine Biannual Survey. Combination procedure service includes 25% thoracentesis, 25% para‐centesis, 20% lumbar puncture, and 30% central venous catheter (CVC) insertions. The number of procedures needed to support a bedside procedure service depends on the types of procedures that the procedure service would perform and the mix of procedures required by the patient population. Because CVCs are the highest revenue‐generating procedures, hospitalist groups should consider performing these procedures at the bedside first. Employed and academic hospitalist groups could support a bedside procedure service with approximately 1 procedure per hour if a combination of the 4 procedures is performed. Lucas B, Johnson T, Franco‐Sadud R, Shaw S. The Economic Impact of a Bedside Procedure Team from the Perspective of a Hospitalist Group Leader. Abstract published at Hospital Medicine 2011, May 10-13, Dallas, Texas. Abstract 73. Journal of Hospital Medicine. 2011; 6 (suppl 2). https://www.shmabstracts.com/abstract/the-economic-impact-of-a-bedside-procedure-team-from-the-perspective-of-a-hospitalist-group-leader/. Accessed April 25, 2019.